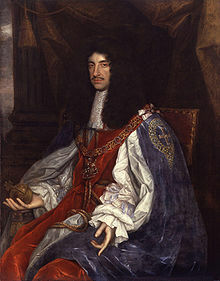 Charles II, Keeng o Scots (29 Mey 1630-6 Februar 1685) wis a keeng o Scots, Ingland, an Ireland. Charles II's faither, Charles I, wis executit at Whitehall on 30 Januar 1649, at the climax o the Inglis Ceevil War. Awtho the Pairlament o Scotland proclaimed Charles II keeng on 5 Februar 1649, Ingland entered the period kent as the Inglis Interregnum or the Inglis Commonweel, an the kintra wis a de facto republic, led bi Oliver Cromwell. Cromwell defeatit Charles II at the Battle o Worcester on 3 September 1651, an Charles fled tae mainland Europe. Cromwell becam virtual dictator o Ingland, Scotland an Ireland, an Charles spent the next nine years in exile in Fraunce, the Dutch Republic an the Spaingie Netherlands. A poleetical crisis that follaed the daith o Cromwell in 1658 resultit in the restoration o the monarchy, an Charles wis invited tae return tae Breetain. On 29 Mey 1660, his 30t birthday, he wis received in Lunnon tae public acclaim. Efter 1660, aw legal documents war datit as if he haed succeedit his faither as keeng in 1649. Charles's Inglis pairlament enactit laws kent as the Clarendon Code, designed tae shore up the poseetion o the re-established Kirk o Ingland. Charles acquiesced tae the Clarendon Code even tho he favoured a policy o releegious tolerance. The major furrin policy issue o his early ring was the Seicont Anglo-Dutch War. In 1670, he entered intae the Treaty o Dover, an alliance wi his first cuisin Keeng Louis XIV o Fraunce. Louis agreed tae aid him in the Third Anglo-Dutch War an pay him a pension, an Charles saicretly promised tae convert tae Catholicism at an unspecifee'd futur date. Charles attemptit tae introduce releegious freedom for Catholics an Protestant dissenters wi his 1672 Ryal Declaration o Indulgence, but the Inglis Pairlament forced him tae widraw it. In 1679, Titus Oates's revelations o a supposed "Popish Plot" sparked the Exclusion Creesis whan it wis revealed that Charles's brither an heir (James, Duke o York) wis a Catholic. The creesis saw the birth o the pro-exclusion Whig an anti-exclusion Tory pairties. Charles sidit wi the Tories, an, follaein the diskivery o the Rye Hoose Plot tae murther Charles an James in 1683, some Whig leaders war executit or forced intae exile. Charles dissolved the Inglis Parliament in 1681, an ruled alane till his daith on 6 Februar 1685. He wis received intae the Roman Catholic Kirk on his daithbed. Charles wis ane o the maist popular an beloved keengs o Ingland, kent as the Merry Monarch, in reference tae baith the liveliness an hedonism o his coort an the general relief at the return tae normality efter ower a decade o rule bi Cromwell an the Puritans. Charles's wife, Catherine o Braganza, bore na live childer, but Charles acknawledged at least twal illegitimate childer bi various mistresses. He wis succeedit bi his brither James. ↑ Ogg 1955, p. 139. This page wis last eeditit on 14 Januar 2018, at 03:11.